Turkey Day is finally here again! This beautiful holiday that calls for us to gather around at the table and celebrate family and friendships and to feast upon all the reasons to be thankful in our lives. 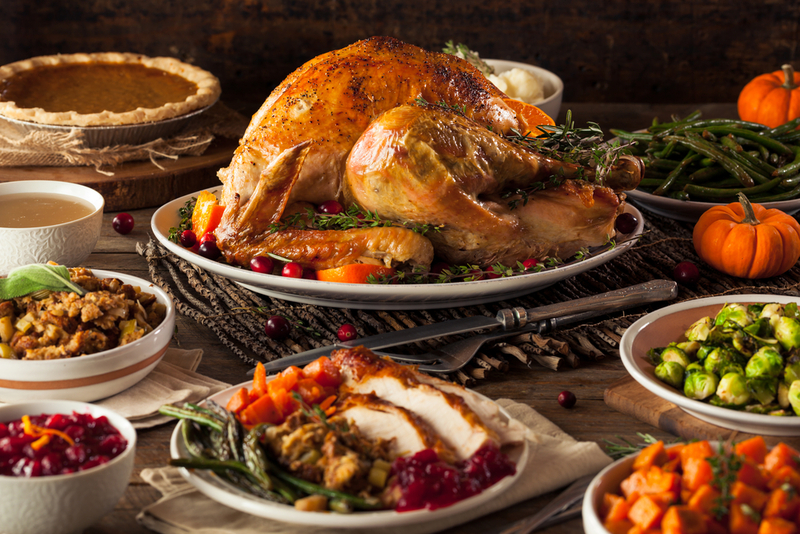 Thanksgiving is one of the most cherished celebrations that brings family and friends together to share in each others lives over one of the most spectacular feasts of the year. In the midst of all this festive thankfulness, it's important to remember that there are safety concerns associated with the Holiday. We've compiled a list of a few holiday hazards to be mindful of as you dive into the holiday season this year. The lists below have been compiled by the National Fire Protection Association, Offices of Roadside and Traffic Safety, and the Food and Drug Administration. Before you start cooking, be sure that your smoke alarms are working properly by testing them. Make sure your family has a fire escape plan, and that you share it with all your arriving guests. Stay in the kitchen when you are cooking on the stove top so you can keep an eye on the food. Unattended cooking, can result in a danger to your home, small children, and pets. Establish a safety zone around areas where hot foods or drinks are being prepared. Have activities that keep children out of the kitchen, and be sure to turn handles inward on the stove to avoid dangerous spills. Keep a pot lid nearby when you are cooking to smother small grease fires. Smother the fire by sliding the lid over the pan, turn off the burner and then leave the pan covered until it has cooled. Make sure there are no combustible items near the stove top, and watch long sleeves while cooking over a hot stove or open fire. Do not leave lit candles unattended or in places where they could be knocked over by children or pets. Always use turkey fryers outdoors... a safe distance from buildings and trees. Make sure the fryers are used on a flat surface to reduce the change of accidental tipping. Never leave the fryer unattended since most units lack proper thermostat controls. If the fryer isn't watched carefully, the oil will continue to heat until it catches fire. Never let children or pets near the fryer when in use. Even after use, the oil inside the cooking pot can remain dangerously hot for hours after use. Use well-insulated potholders or over mitts when touching pot or lid handles and wear safety goggles to protect eyes from oil splatter. Partially-frozen turkeys can cause a spill over and result in a flare-up. Thoroughly thaw the turkey before cooking. Keep an all-purpose fire extinguisher nearby at all times. Among one of the busiest travel times of the year, excited travelers can become more focused on the actual celebration instead of getting to the celebration. So stay focused on driving and pay attention to your surroundings while in the car. Ideally, travel outside the heaviest travel days to avoid congestions - these days are the Wednesday before Thanksgiving and the Sunday afterward. Get your car ready for the road and start your trip with a full tank of gas and a fresh oil change if needed. Make sure your spare tire is filled with air and that you have the appropriate tools to change a tire if the need should arise. Do not text and drive. It is illegal in most states and drivers who text and drive are more likely to get into a crash than those who don't. Do drink and drive. Please hand over your keys to a responsible and sober driver. Be on high alert for deer as you drive, especially at night when it's hard to see. When preparing food, be sure to keep everything clean and to wash hands with warm water and soap prior to handling any food. Rinse fruits and vegetables thoroughly under cool running water and use a produce brush to remove surface dirt and potential pesticides. Never defrost food at room temperature. Food can be defrosted safely in the refrigerator, under cold running water, or in the microwave. Allow the correct amount of time to properly thaw food. For example, a 20-pound turkey needs four to five days to thaw completely in the refrigerator. Be mindful of cross-contamination: keep raw eggs, meat, poultry, seafood, and their juices away from foods that won't be cooked. Use a food thermometer to make sure meat, poultry, and fish are cooked to a safe internal temperature. To check a turkey for safety, insert a food thermometer into the innermost part of the thigh and wing and the thickets part of the breast. (The turkey is safe when it reaches an internal temperature of 165ºF. Cook eggs until the yolk and white are firm. When making your own eggnog or other recipe calling for raw eggs, make sure you're using pasteurized eggs. Refrigerate foods quickly because harmful bacteria grow rapidly at room temperature. Set your refrigerator at or below 40ºF and the freezer at 0ºF. to properly store leftovers. Leftovers should be used within three to four days, unless frozen. We hope these safety tips will give you peace and joy as you celebrate this season. May everyone have a very happy and safe Thanksgiving from Saturn Security Systems!